The Film Development Council (FDCP) of the Philippines congratulated Kapamilya star Piolo Pascual for winning the Asia Star Award at the Marie Claire Star Awards 2018 in Busan, South Korea. 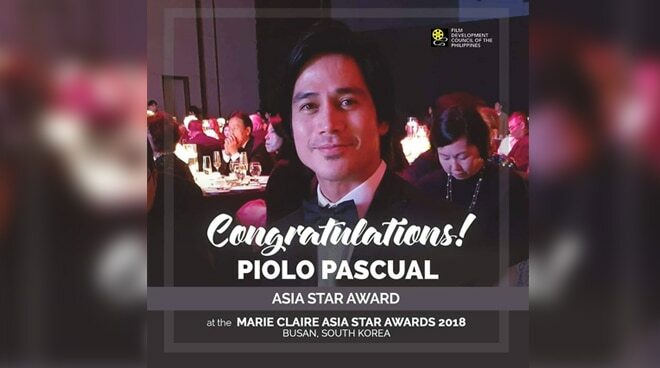 “Congratulations Piolo Pascual for the Asia Star Award given by Marie Claire Asia Star Awards 2018 at Busan, South Korea! Mabuhay ka! #PHCinemaCentennial,” the FDCP said in its Facebook page. In the same event, the Philippines also received the Achievement Award for Philippine Cinema. Representing the country were FDCP Chairperson and CEO, Liza Diño along with Brillante Mendoza, Joel Torre and Christopher De Leon. Aside from the awards night, the Philippine Team being the Country of Focus in this year’s Busan International Film Festival, will hold talks to share their knowledge and expertise in cinema. Featured in these talks are notable actors like Piolo Pascual, Sandy Andolong, Christopher De Leon, Joel Torre, and filmmakers, Kidlat Tahimik and Brillante Mendoza.